• A GENIUS WHO INSISTS ON CREATING: Half-volley winners while twisting backward from the baseline, wrist snaps that astound, laser forehands, unreadable serves, leaping backhand overheads – Roger Federer is on fire again. Then things calm down and you’re lulled into thinking, “What’s the big deal? This guy’s kind of normal” – until he flicks a backhand half-volley from the baseline that drifts the full length of the court before kissing the far baseline. And you snap out of your complacency. You get religion. This is Picasso in sneakers – free-flowing, defying gravity. Roger’s no-limits imagination again soars. Fans gasp. His subtle winners and power groundies sizzle. His angles are severe. His balance is flawless, his movement poetic. His still-fluid-after-all-these-years sprints are bounding bursts. He spits at his 35 years. He’s breathtaking. His performance commands. It seems effortless, almost eerie – both powerful and inventive. His athleticism expresses a balletic grace. His strokes are songs. And all the while, he seems to tap into a trait we’ve seen in many greats (Rod Laver, Bjorn Borg, Stefan Edberg and Pete Sampras come to mind). Call it an almost soothing pool of relaxation, a stillness within the storm of competition, a deep calm that relaxes, centers and ultimately empowers. • THE MAN WHO BENDS TIME: Mary Carillo said, “I’ve never seen anybody make a difficult sport look so beautiful…He’s such an artist. He thinks in artistic ways. He knows how luminous he looks – he’s aware. 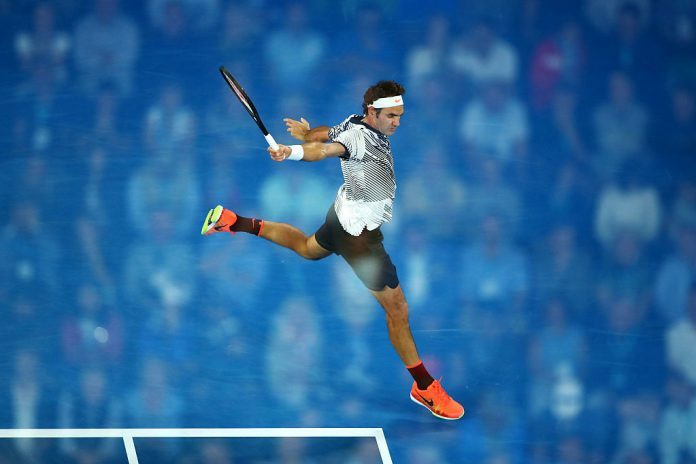 • ROGER AS MARTIAL ARTS MASTER: Deep-think coach Steve Stefanki contends, “Federer plays off of the energy of the opponent. He has all the skills, but he’s not going to impose. • FEDERER AS A FEARLESS ARTIST: Germany’s insightful Andrea Petkovic contended, “Any tennis player is an artist – there are lots of similarities. Artists are in their studios, and we’re on court by ourselves. We both have a million different possibilities. We’re both making all these decisions, often intuitively. With every line artists draw, with every color they pick, they can go any which way, and the painting turns out differently. It’s the same with tennis. Plus, we have the adversity of an opponent. Any decision you make can be your downfall or a way to success. Also, both artists and tennis players have a self-absorbed nature – it’s key. You need to be a little self-centered. As for how Roger has been able to get to where he is now, Petkovic said, “It’s an internal process. I’m sure some people helped him. He is able to be in a mental state where he delivers whatever he has learned. Other players are not able to do that all the time.